If you’re putting together a hanging basket for yourself, or ordering one to give as a gift, the following flowers are great choices. They’re boldly colored, have long and gorgeous stems, and thrive in baskets when watered appropriately. The below flowers are sure to look beautiful in your hanging basket! Hanging baskets bursting with impatiens, or Busy Lizzies, offers a show of color from early summer to late autumn. These flowers have a wow factor that gives life to a backyard or a patio. 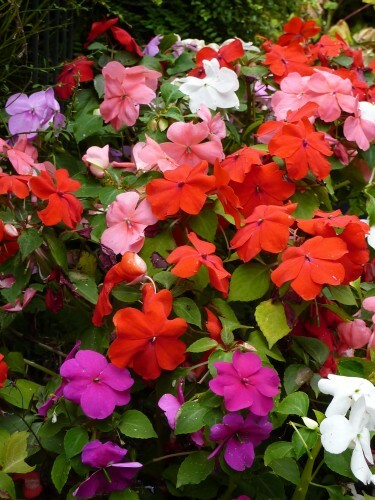 Impatiens come in a variety of vibrant hues, like pink and purple, and you’ll often find them in bi-color versions. Lobelias are perfect flowers for hanging in baskets. They grow on a bushy plant that really fills up a basket nicely. You can choose ornamental or medicinal lobelias. All lobelia varieties are vividly colored and stunning. Choose ivy-leaved pelargoniums for a hanging basket if you’re looking for a flower that’s a bit different from the norm. These flowers grow downward and they sometimes hide in the basket, giving it a lot of depth. Like lobelia, petunias also offer a dramatic statement for a hanging basket. We think these flowers are amazing to keep on a porch, so hang one on each side of your steps or hang many of them. Petunias are weather-resistant flowers that bloom in pure colors and they sometimes come in veined varieties. All of these flowers for hanging baskets will surely brighten up your space and your spirit. They have much potential to bring joy to a day for someone close to you as well. If you know about any other flowers that are great for hanging baskets, we’d love to hear about them. Drop us a note in the comments below and tell us which flowers you love.